What's the No. 1 Road to Rock & Roll destination? Well, to see Elvis and what he left behind. The anniversaries of his birth (Jan. 8) and death (Aug. 16) are major events; his Graceland mansion on the city's south side is the hub of the Elvis Universe. Graceland -- 3734 Elvis Presley Blvd. -- is about nine miles south of central Memphis. The house was built in 1939 by a doctor whose wife's family had long owned the Graceland farm.The mansion is nice, but in our time of McMansions, Graceland isn't palatial. Elvis bought it in 1957 for a bit over $100,000 and moved his folks there from a ranch home he'd bought the year before. The 22-year-old's star was clearly on the rise. The same couldn't be said for the area around Graceland. When suburban flight hit Memphis in the '60s, wealthy residents built mansions east of downtown. Bellevue Boulevard -- the road renamed Elvis Presley Boulevard in 1971 -- was and is a pre-interstate highway to Mississippi, a mishmash of stores and car lots. It looks like Charlotte's South Boulevard, not Queens Road. Not that Elvis had much truck with the neighbors, anyhow. You're asked for cash before you get out of your pink Cadillac. Besides souvenir shops, the official plaza has restaurants (nothing fancy), a theater and two museums. Graceland tickets are sold in the visitor center, as are -- surprise! -- souvenirs. Pay just to see the mansion if your interest is only slight ($22), shell out $8 more for the Platinum Tour that includes the Sincerely Elvis museum ($7 separately, for several rooms of personal items), Elvis Presley Automobile Museum ($12 separately, to view cars and motorcycles) and tour the King's two jets ($8 separately). The $55 VIP tour is for die-hards. Graceland is not well-suited for visitors in wheelchairs or with strollers. You must board a shuttle bus for the ride across the boulevard and through the gates. While the mansion's second floor is closed to the public, some key rooms are down narrow stairways in the basement. 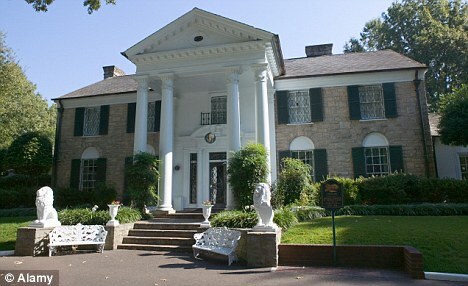 Graceland was built as a private residence, not a walk-through shrine. The standard route through the place is maze-like.If you can't handle stairs, forget about touring the jets at the plaza. Access is walk-up only. Graceland was built more than 60 years ago, when rooms tended to be smaller. At 17-by-24 feet, the dining room is large but not grand. Authorized photos, like those in the "Official Guidebook," make the chambers appear larger than they are and do not show the ropes visitors must peer over. Tip: You can shoot photos inside Graceland, but you can't use a flash. Flashed light harms artifacts. Spokesman Kevin Kern says, "Guides and attendants are fairly well-trained on helping guests turn off the flash on a variety of cameras." If you're unable to do this on your camera, it's OK to hold a credit card or something like it over the flash. The dining and living room you see first are formal; much more interesting are the places where The King relaxed.The kitchen cabinets have see-through fronts; they're filled with everyday glassware and such. And they're still used every December, when ex-wife Priscilla, daughter Lisa Marie and Presley relatives in Memphis gather for an after-tour-hours holiday party. Downstairs holds the pool room and TV room -- well-appointed according to the famous owner's tastes and times, but a gussied-up basement nonetheless. The pool room's ceilings and walls are covered in close to 400 yards of bright print fabric. You can't help but notice the big rip in the tabletop felt. The TV room next to it is an eye-popper in Prussian blue and bright yellow; built into the far wall are three TV sets -- an idea Elvis seized upon after he heard President Johnson liked to watch all three network newscasts simultaneously. There's a small bar, though Elvis was said to be not much for spirits. But he did love TV: More than a dozen sets are around the mansion. Sadly, much of his personal record collection is missing. Archivists snatched most of it. There's a record player and a couple of LP jackets to show where he kept it. So how over-the-top is the decor? You hear a lot about the faux wilderness look of the Jungle Room -- his first-floor den. Its look comes from his fondness for Hawaii, where "decor" is always laid on with a trowel. EP bought the furnishings in Memphis, in a single 30-minute shopping spree in 1974. The room wasn't called the Jungle Room; he simply knew it as "the den." The glass partition that sets off the music room from the living room looks more Shakey's Pizza than Louis Comfort Tiffany. Elvis commissioned the panels, which bear matched peacocks; they replaced glass blocks he didn't care for. And the dining room with its high-back chairs around a 6-foot mirror-top table is ersatz chic. But keep in mind that many rooms have been locked by curators into the colors and furnishings of the 1970s, an era that many professional decorators would just as soon not discuss. Elvis was not well-educated and, despite his wealth, not a recreational traveler. Much of what you see reflects his working-class sensibilities and time spent in glitz-crazy Vegas. But consider this: He could've knocked out walls or built onto the old Georgian colonial house, but he had enough sense to leave it largely alone. The meditation garden (and ultimate Presley resting place) south of the mansion, and the racquetball building out back, were built in 1965 and 1975 respectively. Both are functional; neither is smothered in tackiness. The tour route leaves the house to take in dad Vernon Presley's garage-like office and the trophy building -- a rec room that holds display-case exhibits -- plaques, clothes (including Army fatigues and stage jumpsuits) and curios. The collection is extensive, a place to wallow in pop culture and American folkways. The Sincerely Elvis museum back at the plaza pales in comparison.Part of the racquetball building displays costumes from his later concerts, but the mood is more serious than sequinned. The attendant stationed there tells you Elvis spent part of the morning of Aug. 16, 1977, at the spinet piano in the lounge, playing/singing for girlfriend Ginger Alden and Presley cousin Billy Smith and his wife. That concert for four, which included singing "Blue Eyes Crying in the Rain" and "Unchained Melody" was his last gig: Elvis went to bed and was found dead hours later. In both buildings, you have elbow room just to linger. The Lisa Marie, at the plaza, is intriguing -- a Convair 880 jet that may be the only walk-through attraction time-bending curators haven't fiddled with. He purchased it in 1975 and would probably think it little-changed. As his "flying Graceland," the Lisa Marie is his lifestyle in miniature. Some touches show his affection for conspicuous consumption: The guest bathroom up front has a sink basin with gold flecks and gold-plated sink. More intriguing are the personal details learned from video monitors that offer snippets about the King and his jet, like his choice of in-flight beverages -- lime Gatorade and diet Dr Pepper. Or his taste in the then-new world of home videos. His favorites? "Blazing Saddles," Peter Sellers movies and episodes of "Monty Python's Flying Circus."